On Nov. 14, The Korea Times interviewed Lee Chun-sik at his home in Gwangju. Lee is the first wartime forced laborer to win a compensation suit against a Japanese firm. He gave us his thoughts on the historic ruling last month and recounted his time at a steel mill in Kamaishi, Japan. 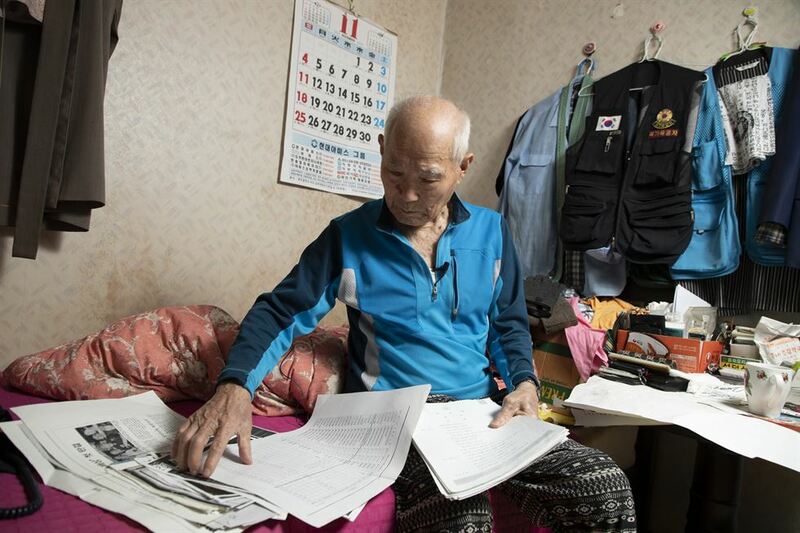 Lee Chun-sik, 94, is a self-proclaimed patriot. But his faith in his country took a blow in the long court battle demanding compensation for his forced labor at a Japanese steel mill during World War II. The judiciary power abuse scandal this year revealed the previous government and Supreme Court systematically held back Lee's and other wartime forced labor cases for five years to maintain good ties with Japan. The delay was costly. Three plaintiffs passed away during this time, leaving Lee alone in the courtroom, Oct. 30, to hear the first legal victory for wartime forced laborers. "They say it happened during President Park Geun-hye's administration, and the minister of foreign affairs was also involved," Lee said with a conflicted expression, sitting in his home two weeks after the ruling. "I wonder why they did such a thing." Tired of the drawn-out legal battle, Lee tried to drop out of the lawsuit ― filed against Nippon Steel in 2003 ― several times. But he always showed up at the lawyer's office at the last minute, carrying requested documents. "It was very stressful for him to go back and forth to the courtrooms," Lee's eldest son Lee Chang-hwan said. "I think he held on in the end because he knew the lawsuit would have bigger repercussions for other victims of wartime forced labor." Yet with Nippon Steel toeing the line with the Japanese government's vocal opposition to the ruling, getting the 100 million won ($87,000) compensation may mean another long fight. Lee wants the Korean government to step in. "The government should take care of the uncollected compensation in advance," Lee said. "If I die tomorrow, what then?" Despite his age, Lee still remembers how he ended up at the steel mill in Kamaishi. In 1941, during the 1910-1945 Japanese occupation of Korea, Lee, 17 at the time ― along with 80 other middle and high school students ― was "chosen" by the then Japanese mayor of Daejeon to join a "national service squad." "They told us we would learn advanced technical skills, as well as study," Lee said. The group held a farewell event in front of City Hall before boarding a train to Busan. From there they were ferried across the waters to Shimonoseki, Japan. After a stopover in Tokyo, Lee arrived at Kamaishi, formerly known as the "steel town" of Japan's eastern coast, but soon realized his expectations were far from reality. "All I did there was hard manual work," Lee said. "Whenever the train from Hokkaido appeared out of the tunnel, we unloaded coke and shoveled it into the smelting furnace." The factory was filled with dust and poor electrical wiring. Korean laborers were assigned to the most strenuous and dangerous tasks. Injuries were commonplace, sometimes resulting in death. Lee himself was hospitalized for three months after tripping over molten steel on the factory floor. After work, they rested in the factory's dormitory rooms, each holding about a dozen people. For the first six months, no one was allowed to leave the factory grounds. "They used a brass horn to wake us up, and to tell us to go to bed or work. Everything was timed to the minute," Lee said. Lee never received any wages over his three years at the factory. "They told us the Japanese government was saving up our wages in a separate account, to give it to us all at once when we finished," Lee said. After the first six months, Lee and his fellow Korean laborers were allowed to leave the factory and visit the town on Sundays. Having no money on them, they earned their meals by helping locals out with their work. "Japanese fisherman invited us onto their boats to go fishing with them at the port," Lee recalled. "If I caught some tasty ones, they treated me to a meal at their house." After three years, he was given a physical test and sent to train at Japan's military training base in Yongsan in Korea for three months. Afterward, he was put in charge of watching over U.S. military prisoners at a base in Kobe, Japan. Japan's surrender finally ended World War II in 1945 and liberated Korea. Lee went back to Kamaishi to collect his wages, only to find the steel mill had been bombed to rubble. He later found out from the company's files ― published by a Japanese academic ― that only 23.8 yen ($0.20) had been saved in his name. 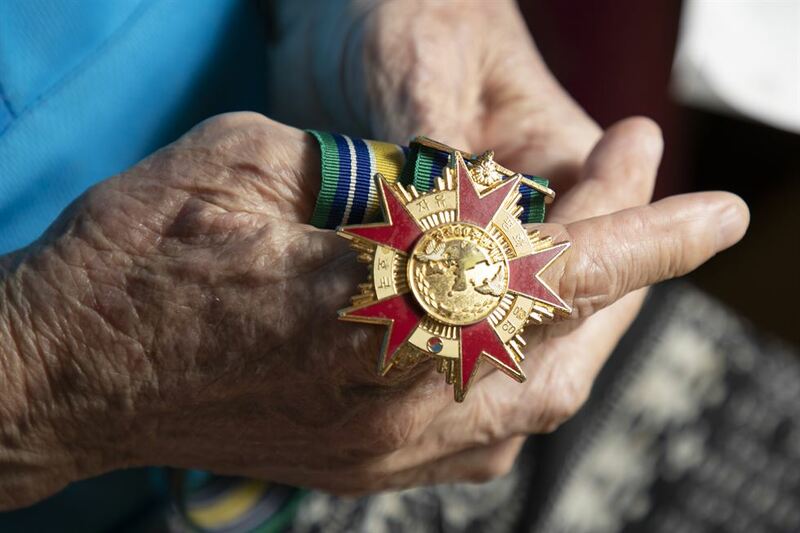 Left with no choice, he went back to Korea and became a police officer, and weathered through another conflict, the Korean War, a few years later, this time as a soldier. Lee says he does not blame all Japanese people for the overdue wages or an apology. He has received a continuous flow of support from Japanese civic activists and lawyers over the long legal battle. "I don't know why Prime Minister Abe is so greedy, but the Japanese in general are upright people." He hopes his ruling will give other victims the courage to speak up. "They should also hurry up and get a trial too while they are still alive," he said with a sigh. "Otherwise, they won't be able to get peace of mind before they die."